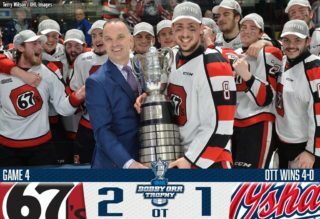 The Oshawa Generals opened the scoring 13 seconds into regulation but it would be the Niagara IceDogs who had the last laugh as Jason Robertson (3) scored the overtime winner from close quarters 4:14 into the extra frame. Ivan Lodnia and Ben Jones picked up assists on the game winner as Niagara outshot Oshawa 50-25. Jones (2) and Drew Hunter (2) also scored for the Dogs as they took a 1-0 series lead before a crowd of 5,300 in St. Catharines. 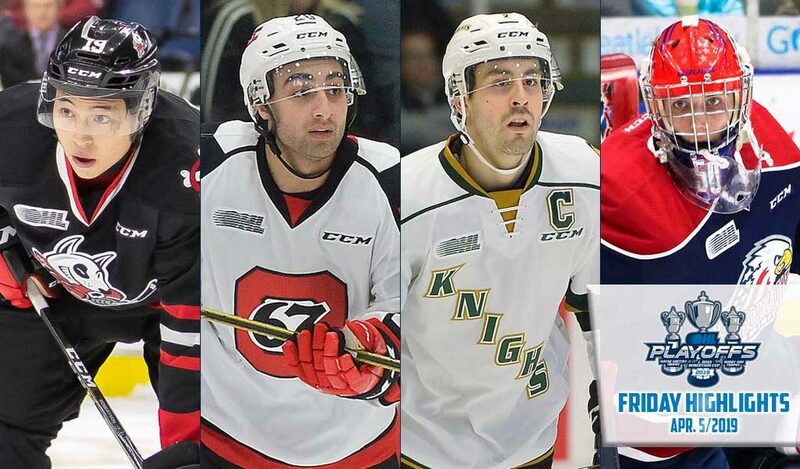 The IceDogs were without the services of star forward Akil Thomas who was out of the lineup. Generals netminder Kyle Keyser made 47 saves in the loss while Cole Resnick (3) and Brandon Saigeon (2) scored goals in front of him. Lodnia picked up assists on all three Niagara goals as the IceDogs are in the driver’s seat to start the series with Game 2 in St. Catharines on Sunday afternoon. 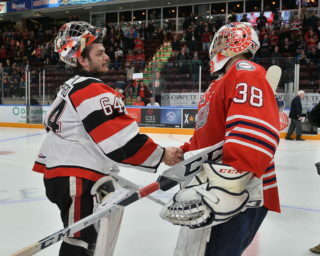 Billed as a goaltending duel, Game 1 between the Ottawa 67’s and visiting Sudbury Wolves resulted in a combined 13 goals. The host 67’s overpowered the Wolves as Lucas Chiodo (2, 3, 4) and Tye Felhaber (1, 2, 3) both netted hat-tricks while Kevin Bahl (1) and Sam Bitten (1) added singles. A four-goal second period chased Sudbury’s Ukko-Pekka Luukkonen from the crease after four goals on 23 shots. The 67’s led 5-1 after two periods before Sudbury pulled within two to start the third. Ottawa put things out of reach late, outshooting Sudbury 41-28. Kyle Maksimovich picked up four assists in the win while Noel Hoefenmayer tacked on three helpers. Adam Ruzicka (1) led Sudbury with a goal and two assists while other Wolves goals came from David Levin (4), Blake Murray (4), Cole Candella (2) and Owen Gilhula (1). The two clubs combined for seven third period goals in an explosive finish, setting the stage for Game 2 in Ottawa on Sunday afternoon. The London Knights were flying on Friday, staking out a 2-0 lead after one period to eventually defeat the visiting Guelph Storm 3-2. Liam Foudy (2) got things started before Josh Nelson (1) made good on a penalty shot attempt inside the final minute of the first frame. Guelph’s Owen Lalonde (1) put the Storm on the board 4:50 into the second before Kevin Hancock (2) reinstated the two-goal cushion on the power play at 10:18. MacKenzie Entwistle (3) would bring the Storm back to within one midway through the third but that’s as close as the Storm would come as London took Game 1 before a crowd of 8,391. London outshot Guelph 39-24 as Jordan Kooy made 22 saves for the win across from Guelph’s Anthony Popovich who made 36 saves of his own. Dmitri Samorukov picked up a pair of assists for Guelph as the Storm look to rebound in Game 2 back in London on Sunday afternoon. 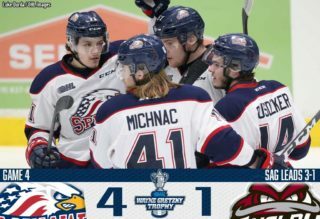 Ivan Prosvetov was stellar yet again while Owen Tippett (6, 7) scored twice and added an assist as the Saginaw Spirit prevailed over visiting Sault Ste. Marie 4-1. New York Islanders prospect Bode Wilde (3) blasted home the game winner 8:21 into the third period before the Spirit tacked on a pair of empty netters. Damien Giroux (5) also got onto the scoresheet for the Spirit as they sent 5,408 at the Dow Event Center home happy. 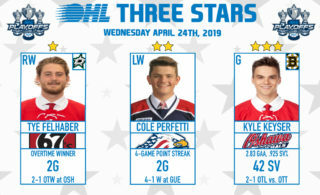 Prosvetov earned first star honours with 34 saves as the Spirit won despite being outshot 35-33 while holding the Hounds to 0-for-7 on the man advantage. Matthew Villalta made 29 saves at the opposite end while Jaden Peca (1) provided the lone Soo goal. The Spirit win snaps a 13-game playoff losing streak against Sault Ste. Marie dating back to 2007. Game 2 of the series goes Sunday evening in Saginaw at 5:30pm.